Last weekend I played Mario Party 9 with my boyfriend. We are not a huge fan of the new game play, but my boyfriend is a huge mario fan. He always plays yoshi and has a few favourite characters. 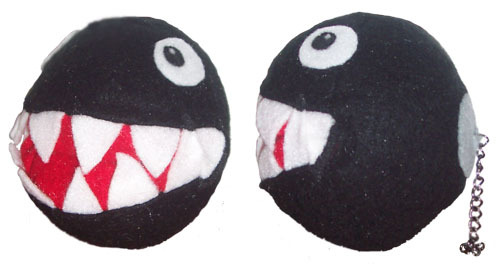 Back in 2010 I made him a chain chomp plushie. 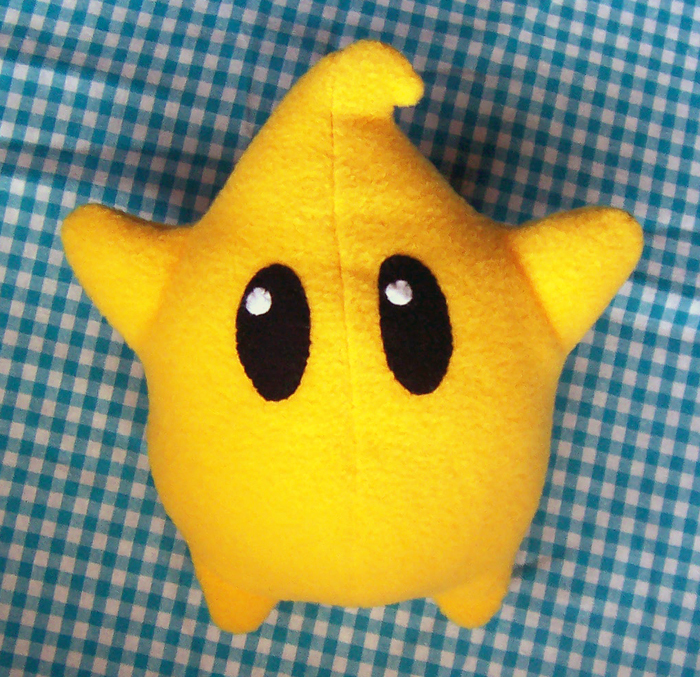 And this week I made him a luna plushie. I always love making plushies or cushions from books, games etc. It is so amazing seeing something from paper take a 3D form and be all cuddly. This entry was posted in Blog on April 25, 2012 by Handmade Cuddles. 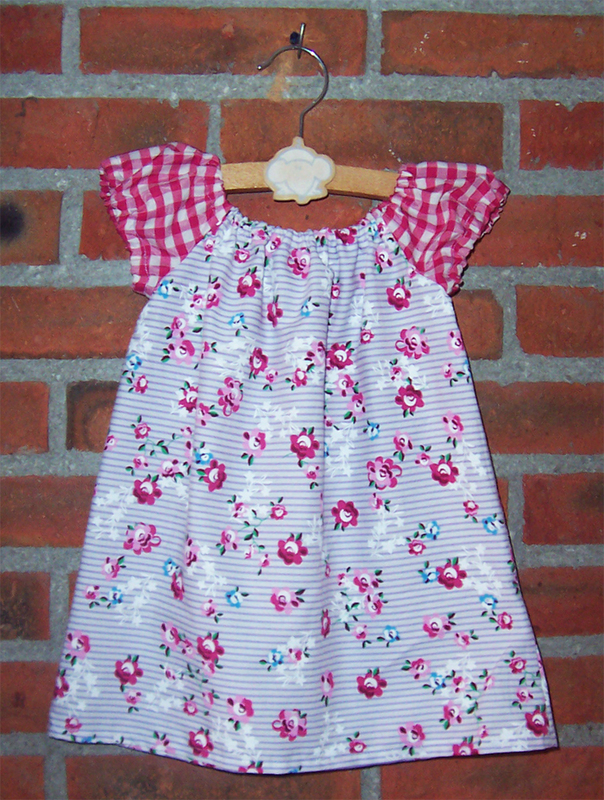 A friend of mine in the UK had a baby girl a few weeks ago : ) So I jumped on the chance to make another pretty peasant dress!! 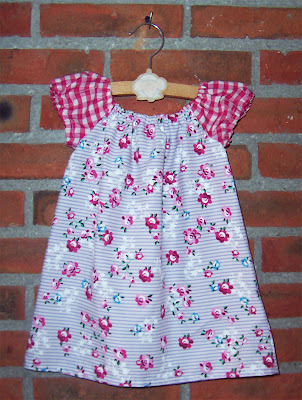 I bought some really lovely purple flower fabric and made this sweet little dress for her. I enjoy making these so much that I am making another one in blue patchwork fabric. I don’t have anyone intended to receive it yet so might add it to my etsy shop. But we will see. This entry was posted in Baby on April 24, 2012 by Handmade Cuddles. Well my birthday is Monday, but my boyfriend has to go away Monday afternoon for the week. So I decided to make my birthday cake today so we had time to eat and enjoy it over the weekend! 1. Preheat the oven to 180 *C (or 350 *F) and prepare a 9″ round tin with baking paper (or use a silicone one). 2. Melt your butter in a large bowl in the microwave, be careful to not burn it. 3. Once it is all melted, add in the caster sugar and vanilla extract and blend together. 4. Then add the eggs (and don’t drop 1 one the floor like me) and mix well with a large spoon. I don’t like to use a electric mixer as it adds too much air to the mixture. 5. In a separate bowl, mix together the cocoa powder, flour, baking powder and salt. Make sure their are no lumps. 6. Slowly add the cocoa mixture to the butter mixture, 1/3 at a time. Again mix it in with a large spoon rather than an electric mixer. 7. Pour the mixture into the round tin and spread out evenly. Place in the oven for about 35minutes. To check the cake is cooked prick the middle with a fork or toothpick, if it comes out clean it is ready! Let the cake cool in the pan for a couple of hours before adding the frosting. 1. Once your brownie cake has cooled enough it is time to make the frosting. Don’t remove the cake from the tin yet!! 2. Melt 20g of butter in the microwave. 3. Add the sugar and milk and stick it back in the microwave for between 30seconds to 1 minute. You want the mixture to boil and get all foamy and bubbles in the bowl, but to not burn. So it is important to stand and watch it in the microwave. 4. Remove from the microwave and add the broken up chocolate and stir. The chocolate should melt into the mixture completely. If it doesn’t add it back to the microwave for 10second bursts till it is all melted. 5. Pour the frosting over the cake, spreading it out to cover the whole top, right up to the edges of the pan. Sprinkle over you sprinkles or chocolate flakes or smarties etc. 6. Let it cool for about an hour, or stick it in the fridge if that is too long to wait!! 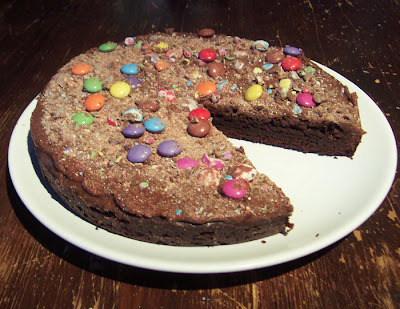 And Enjoy your brownie cake!! This entry was posted in Recipes on April 20, 2012 by Handmade Cuddles. Last week I shared a felt rainbow cake tutorial over on Sew Sweets blog. It was their 1st Shop birthday and they had some great celebrations going on, it was fun. Well for those that missed the tutorial here it is again. And something for the rainbow stripes, this can be felt, ribbon, ric rac etc, it just needs to be 75mm wide or smaller. 1. Download the pattern and use it to cut out your felt pieces. I added a layer of interfacing to my felt, but you can also cut a cardboard version of the cake base pattern piece and insert it into the cake to keep the shape better (do that later on). 2. Take your vanilla cake edge, and cut 6 pieces of felt or ribbon just a bit longer than the felt piece. 3. Mark a line down the middle of the felt piece, and start glueing the ribbon down along the line. I glued mine, but you can sew them on as well if you prefer. 4. Keep adding the bands of ribbon till you have a rainbow, and trim off the excess ribbon from each end. 5. Take your vanilla felt base and pin it to the to the purple ribbon edge of the cake. 6. Fold the cake edge around, to continue pining the cake base for the whole corner. 7. Sew around the edge, when you get to the corner, stop and turn the felt and keep sewing down the other side. 8. Repeat the same with the baby pink felt piece to make the top of the cake. 9. Take the last felt piece, and pin the shorter ends to each end of the cake. Sew along these, leaving about 1/2cm unsewn at the start and end. 10. Then pin the baby pink pieces together, and sew along the edge. 11. Pin the other open edge and sew along it, but this time leaving a 2cm gap in the middle. 12. Turn the cake right way out through the gap. If you are not using interfacing, add in your cardboard cake base now. Stuff your cake with lots of poly fill. 13. Ladder stitch shut the opening. 14. 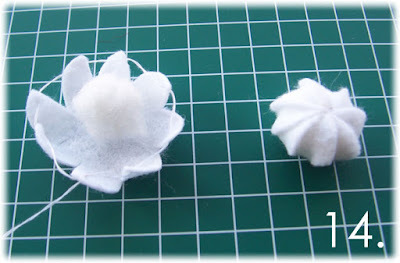 Take your felt cream puff, and sew through all 8 points. Add a small bit of polyfill in the middle and pull and the points tightly to the centre. Do a few more stitches to secure the points. Repeat for a three more cream puff (4 total). 15. Cut a 8cm by 5cm piece of white felt. and cut out a flame shape from yellow felt. Place the flame near the end and start rolling the felt into a tube. 16. Glue down the edge of the felt to glue it down. If needed trim some off the bottom so it is flat. 17. Wrap a coloured thread around the candle to make a spiral effect. Knot the thread at the end. To finish off the cake slide, hot glue the cream puffs and candle onto the cake, or you can stitch them on. All finished!!! Happy Birthday Sew Sweet!! 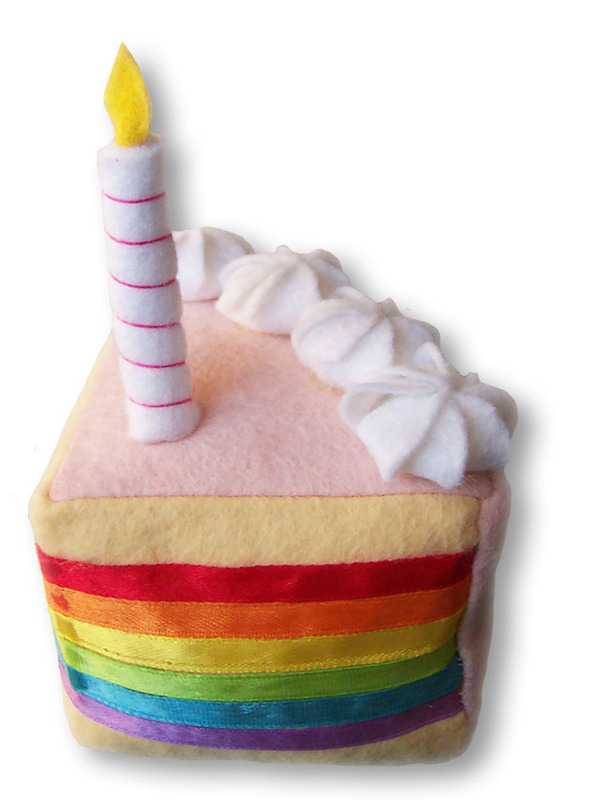 This entry was posted in Felt, Tutorials on April 13, 2012 by Handmade Cuddles.